After doing a number of custom orders, I am taking a few days to work on some of my own quilts - some for sale and some for my own home. One of the great things about selling on Etsy is the teams of sellers that are formed to provide support and advice on all things about being an online entrepreneur. 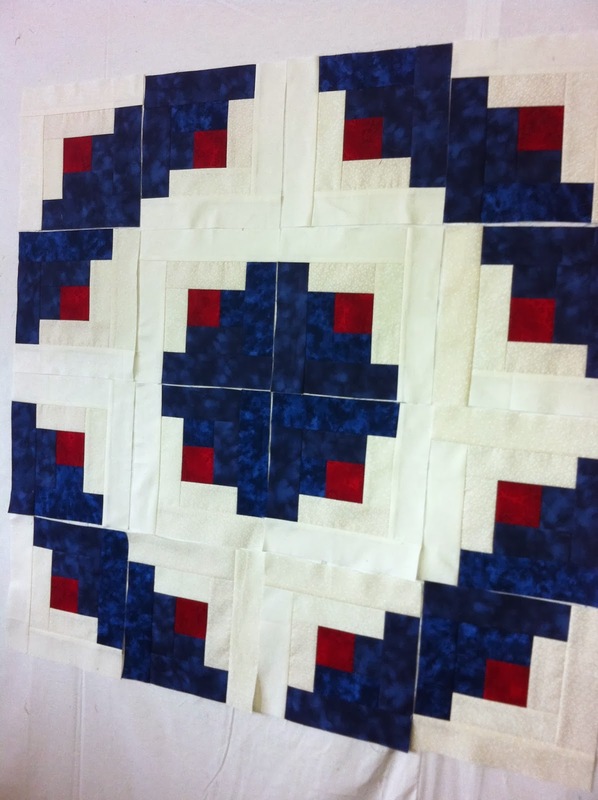 I belong to a few teams, and the Quiltsy team is the one I go to for all things quilt related. This month they are having a challenge for Worldwide Quilting Day - go back to your first ever quilt and make something new inspired by it. My first full-size bed quilt (well, it did cover the top of a twin bed!) 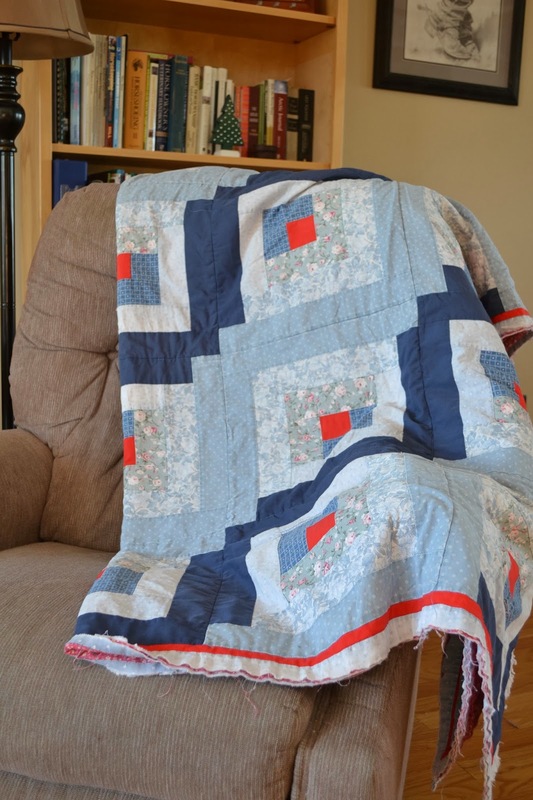 was a log cabin quilt for my oldest son, the electrician, when he moved from the crib into a big boy bed. As you can see from the original quilt above to the faded and worn quilt below, this quilt was well-loved and used! 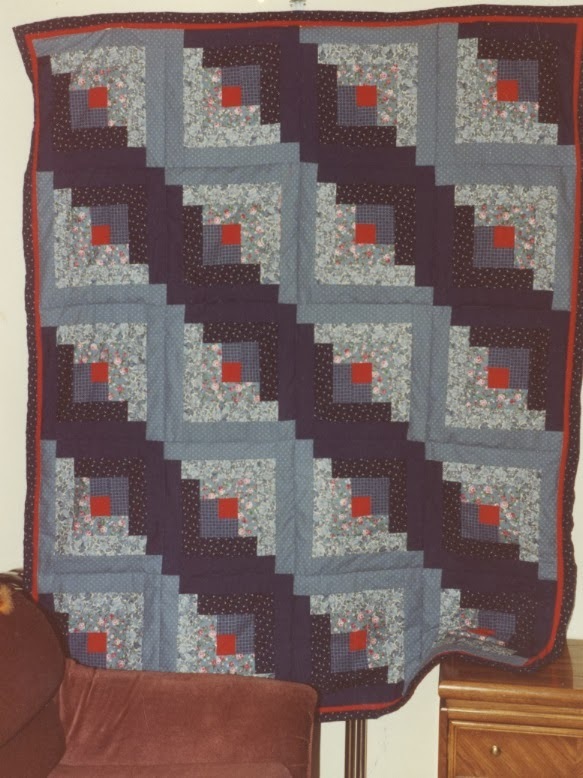 Same log cabin quilt many years later! I decided on a smaller version of a log cabin and quickly pieced the blocks and put them up on the design wall. And realized that I should have started the rounds around the center with the light strips rather than the blue. The red squares just blend in with the blue in this version, but it will have to do as I am not unsewing every block to make it right. In hindsight, I should have made one single sample block before I went ahead and assembly line pieced all the blocks at the same time. The white areas will look great with some decorative quilting and I hope this will be done before Worldwide Quilting Day on Saturday! Your 'used' quilt is as lovely now as it was then :-) This is a neat challenge, it will be interesting to see what everyone does - will there be a link somewhere to see all the versions? The only link I have to all the projects is a private chat - I'll see if I can get some photos up through Flickr or the Quiltsy blog. I love log cabins! Pretty!